Most people know juvenile offenders only from daily headlines, and the images portrayed by the media are extreme and violent: predators and even “superpredators.” Distorted and incomplete, these pictures shape the way Americans think and feel about city kids, poor kids, children of color. A Kind and Just Parent gives us a transformative view of kids caught up in the justice system that we could never get from nightly news and newspaper stories. William Ayers has spent five years as teacher and observer in Chicago’s Juvenile Court prison, the nation’s first and largest institution of juvenile justice, founded by legendary reformer Jane Addams to act as a “kind and just parent” for kids in need. Today, immensely confused and confusing, it serves as a perfect microcosm of the way American justice deals with children. 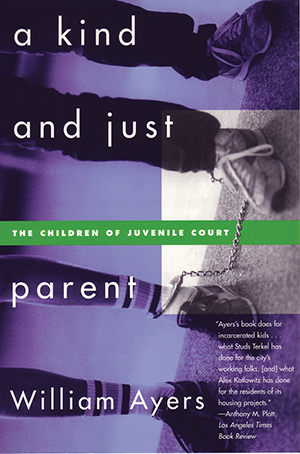 Through brilliant storytelling, Ayers captures the lives and personalities of young people caught up in the juvenile justice system. The book follows a year in the life of the prison school. Its characters are three dimensional: funny, quirky, sometimes violent, and often vulnerable. We see young people talking about their lives, analyzing their own situations, and thinking about their friends and their futures. We watch them throughout a school year and meet some remarkable teachers. From the intimate perspective of a teacher, Ayers gives us portraits, history, and analysis that help us to understand not only what brought these kids into the court system, but why people find it hard to think straight about them, and what we might do to keep their younger brothers and sisters from landing in the same place. Unsentimental yet wrenching, A Kind and Just Parent is a riveting look at kids and crime. It will change the way Americans think about juvenile crime and juvenile justice.